Click above to watch the teasers and main title sequence from The Underground Man, originally shown on NBC-TV on May 6, 1974. Actor Peter Graves was found dead Sunday at his home in Pacific Palisades, according to law enforcement sources. Graves, who starred in “Mission: Impossible,” “Airplane!” and Billy Wilder’s “Stalag 17”--apparently died of natural causes, the sources said. Graves was 83, according to a biography on the Web site IMDB.com. There seems no doubt that Graves, who was actually born Peter Aurness (the younger brother of Gunsmoke star James Arness) in 1926 in Minneapolis, Minnesota, will be most widely remembered for his role as Jim Phelps, the no-nonsense head of a contingent of secret U.S. government agents, on the long-running CBS-TV action series Mission: Impossible. But I remember him as well for playing Lew Archer, author Ross Macdonald’s compassionate Los Angeles private detective, in the 1974 NBC-TV flick The Underground Man, based on Macdonald’s 1971 novel of that same name. This was the second time Archer had been portrayed by a Hollywood actor (Paul Newman played Macdonald’s man--renamed Lew Harper--in the 1966 film Harper), but the first time he’d appeared in an original TV production. 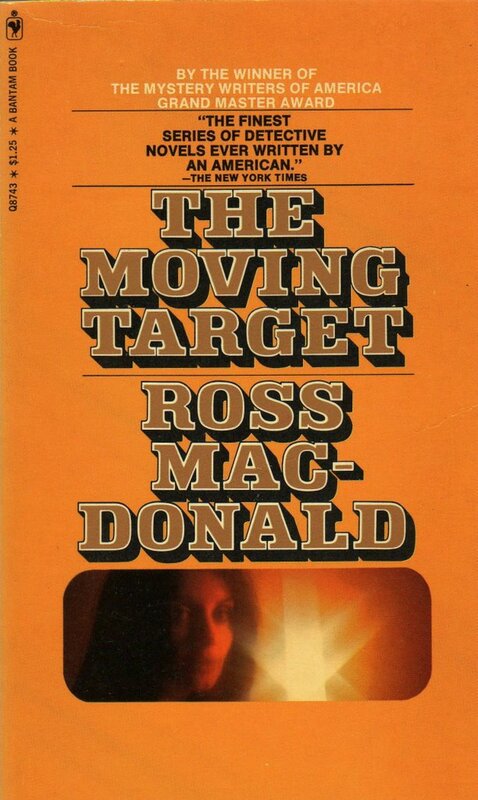 As Tom Nolan recalled in Ross Macdonald: A Biography (1999), Macdonald--whose real name was Kenneth Millar--watched some of the filming of that TV movie, which was also supposed to be the pilot for a prospective Archer series. Millar approved of Graves (“a serious and very pleasant man”) as his detective; in fact, he told L.A. Times columnist Cecil Smith, he’d had a sort of premonition about the actor: “In thirty years of writing about Lew Archer, I never thought much about how he looked. Except that he was Californian, tanned, athletic. Then one night a few years ago, I saw Peter on Mission: Impossible and thought, ‘That’s Lew Archer; that’s the way he looks.’ It was really quiet eerie when I was told Peter was playing Lew, because I had nothing at all to do with the casting. Even stranger was the casting of Dame Judith [Anderson] as Mrs. Snow. All the way through the writing of the book, the image I had in mind for Mrs. Snow was Judith Anderson, who is a neighbor of ours in Santa Barbara [California]. It gives you the feeling of having had it all happen before.” Another thing Millar noted with surprise was how much he identified with his fictional character: whenever one of the actors in a scene addressed “Archer,” Millar looked up. With all due respect, I must disagree with those naysayers. Having watched The Underground Man only recently, I think it is true to the spirit, if not always the details of Macdonald’s book. Yes, Graves’ Archer has a home among L.A.’s Venice canals, rather than an apartment out in West Los Angeles; and yes, it was probably a mistake to move the investigator’s place of business from an office on Sunset Boulevard to a bar. On the other hand, Graves did definitely look the part, and he had the combination of energy, empathy, and determination needed to fill the big gumshoes into which Macdonald had long fit his protagonist. This Paul Wendkos-directed teleflick benefited, too, from its impressive roster of guest stars: not only Dame Judith, but also Jack Klugman (two years before he appeared in Quincy, M.E. ), Jim Hutton (more than a year before he began his star turn in the series Ellery Queen), Jo Ann Pflug, Vera Miles, and the then-captivating Kay Lenz as a woman in trouble (the sort of part in which she always excelled). Composer Marvin Hamlisch, who by then had put together scores for motion pictures such as The Way We Were and The Sting, gave The Underground Man a poignant, eminently hum-able score, and its main title sequence--embedded atop this post--looked for its typographical and image design to Bantam Books’ familiar 1970s line of Archer paperbacks (such as The Moving Target). For readers who’ve never seen The Underground Man, but would like to, there are reasonably priced but unofficial DVD copies available on the Web, both through iOffer and Modcinema. Graves, whose acting career began in earnest in the 1950s, won his first starring role in a TV series in the western Fury (1955–1960). He was later featured in the World War II-era crime drama, Court Martial (1966), playing Major Frank Whittaker of the Judge Advocate General’s (JAG) office. In 1968, Graves starred in Call to Danger, a CBS-TV adventure series pilot about “a secret government agency whose mission is to solve cases that stump other law enforcement offices.” The show looked to have a good shot at winning a slot in the coming season’s schedule--until CBS decided it would prefer to see Graves replace actor Steven Hill (later to star in Law & Order) as the team leader on Mission: Impossible. 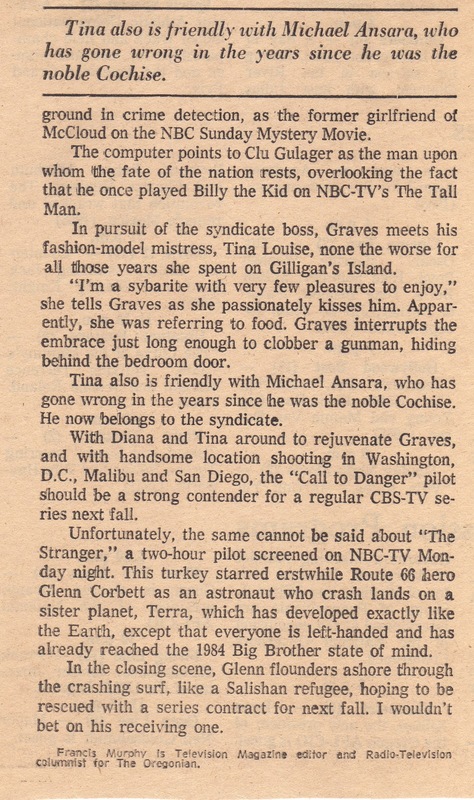 Five years later, in 1973, Graves--fearing that Mission’s mission would soon be cancelled, and wanting another project to fall back on in that event--signed on to star in a second CBS pilot titled Called to Danger. According to one synopsis of the film, he portrayed “a federal agent who enlists ‘ordinary’ people to solve crimes. Headquartered in Washington, D.C. (where most of this film was shot), Graves selects his erstwhile agents by means of a computer.” In a piece for the Portland Oregonian (embedded at right--click to enlarge the images), radio and television columnist Francis Murphy wrote that Call to Danger “should be a strong contender for a regular CBS-TV series next fall.” Yet, although Mission: Impossible went off the air in March 1973, Call to Danger wasn’t called in to replace it. Graves was suddenly without a series commitment. He was therefore free to star in The Underground Man. 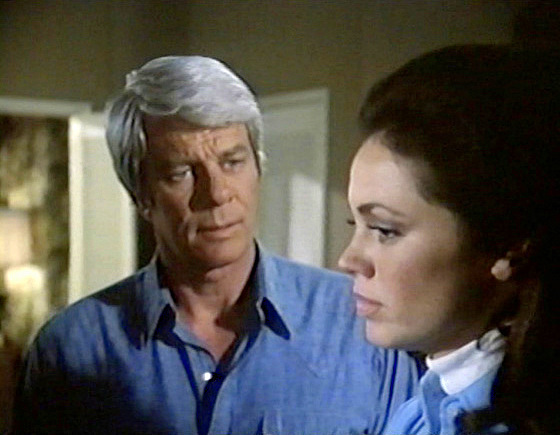 Not until 1988, with the revival of Mission: Impossible, did Peter Graves headline another TV series. And that show only lasted until early 1990. * Just four months after the final episode of Archer was broadcast in March 1975, Paul Newman returned to the big screen in his second adaptation of a Ross Macdonald novel, The Drowning Pool, again starring as the renamed Lew Harper. Pool wasn’t as good as Harper, but it was still better than NBC’s Archer, much to the relief of faithful Macdonald readers like me. READ MORE: “R.I.P., Peter Graves,” by Marty McKee (Johnny LaRue’s Crane Shot); “Peter Graves, ‘Mission Impossible’ Star, Dies at 83,” by Michael Pollak (The New York Times); “Peter Graves, R.I.P.,” by Randy Johnson (Not the Baseball Pitcher); “Peter Graves Dies at 83; Star of TV’s ‘Mission Impossible,’” by My-Thuan Tran (Los Angeles Times); “Peter Graves (1926-2010)” (Television Obscurities); “‘Mission Impossible’ Star Peter Graves Dead at 83,” by Bob Sassone (TV Squad); “Classic Television Showbiz’s Night at the Drive-in: Killers from Space, starring Peter Graves (1954),” by Kliph Nesteroff (Classic Television Showbiz); “Peter Graves’ Unanswered Call to Danger” (The HMSS Weblog).